The first thing I noticed was the cover. It’s very eye catching with the color red being predominant also aided it in sticking out on the stands. The art on this issue was provided by Mike Perkins is very detailed and fitting. The action sequences are very strong in that they are very fluid. This issue also presented us with the general mantra of the book which is pretty much the same as his Agents of Shield season one rendition. 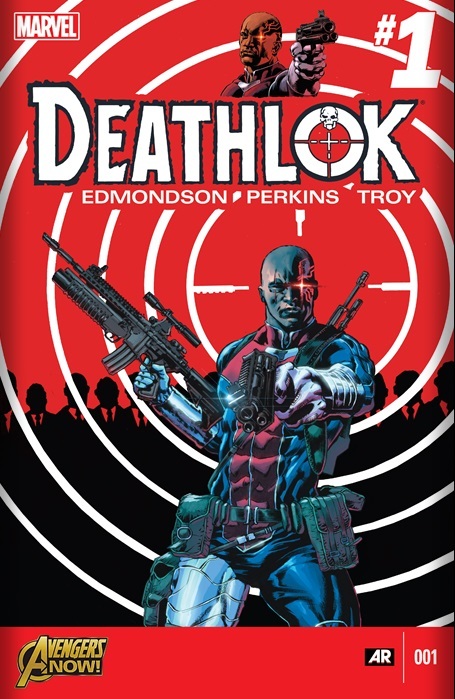 For those coming into Deathlok from the show they should be happy with this issue though if your a fan of a particular version of Deathlok you will not be happy with Henry Hayes. I also enjoyed the moments of peace which showed the effect that these excursions are having on his personal life. What I was not fond of was that the art while good in action scenes was ill equipped to deal with the softer scenes. The exchanges with Henry’s daughter were statuesque and stiff. Overall though I truly enjoyed this opening issue.